The Elkin Creek Mountain Bike Trail is typically closed after rains and while the trail is muddy and wet. November 1 – March 31: Use lower entrance at dam. April 1 – October 31: Use upper entrance above reservoir. 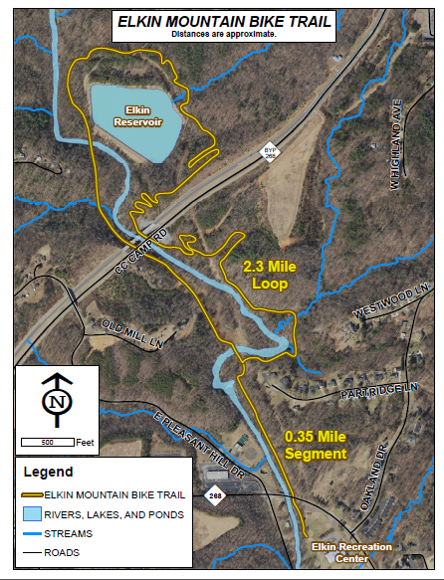 For a Trail Map and more information, visit the Elkin Recreation and Parks website. Three great paddles on the Yadkin! Ronda to Elkin: 7 miles, 3 to 4 hours of leisure floating with take out downtown Elkin. Elkin to Burch Station takeout (Mitchell River): 6.5 miles, 3 hour leisure float. Combine with # 1 for a 13.5 mile 6 hour float. Burch Station (Mitchell River) to Rockford: 12 miles, 6 hour leisure float. Start at Elkin for a full day 18.5 mile float. Four beautiful bike rides in the heart of Yadkin Valley Wine country. 50 mile loop north through Mountain Park area vineyards with rolling terrain and numerous strenuous hills and one mountain. 71 miles east and north of Elkin passing numerous vineyards, rolling terrain with a number of strenuous hills. 100 miles north, south and east with rolling terrain and numerous strenuous hills. 7,000 feet of climbing. Go to: http://yvtdv.com/theRide.html for details and maps of each ride.